Hollywood Rip, Ride, Rockit was one of the biggest letdowns of 2009. The ride was supposed to be open by the beginning of summer, but it wasn’t until the end of the summer when the ride opened. Numerous construction and technical problems pushed the ride back farther and farther. Many people were wondering if it was ever going to open before the summer ended. Once the ride opened, it was still plagued. The boarding process was very slow and some trains have valleyed. We’ve also heard reports of some trains being very rough, while others are soon. This ride has been far from what Universal Studios had in mind. It has become better lately, but it has taken a long time to get to it. 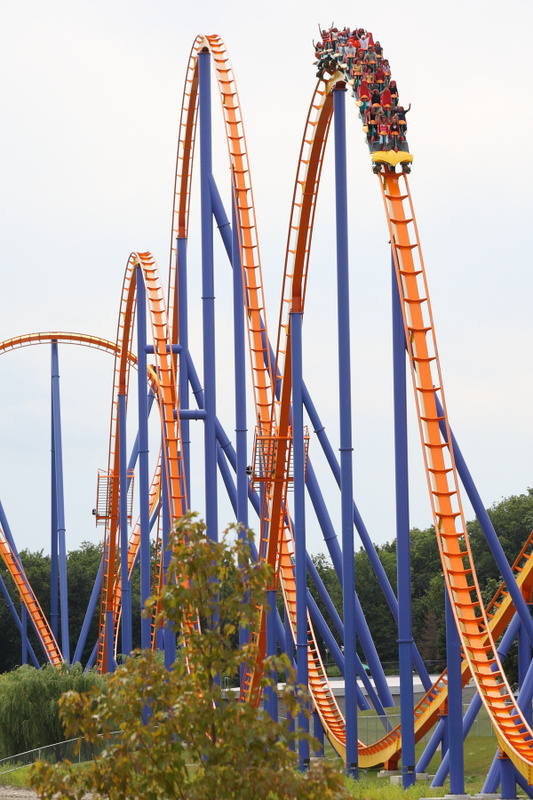 In an attempt to make their coasters even better, Six Flags decided to re-theme two of their biggest coasters, Medusa at Great Adventure and Superman: Ride of Steel at New England. Like X2 at Magic Mountain, they added various effects to the rides. Did these effects work? Not so much. They spent millions on each coaster adding audio onboard, giant poster scenes out of comic books, and as always, fire. It almost seems these millions were wasted for nothing. People have said the effects don’t really do that much, and if anything, make the rides worse. We’ve heard complaints about Bizarro at Six Flags New England, the #1 steel coaster in the world, not being enjoyable anymore because of the blaring music. It may have been better for Six Flags to save their money and build new rides. Even though it was built in 2002, Xcelerator at Knott’s Berry Farm had more troubles that deserve attention. Intamin Accelerators have never had great uptime, as they continually break down. This year something terrifying happened that no coaster fan, or guest, wants to see. During the launch, the cable snapped sending shrapnel towards riders. An insider at Knott’s leaked the footage from the on-ride camera of the first row riders. We see the ride launch, then metal shreds going everywhere and the riders in pain. The ride comes back down the hill and they are in panic of course. This video has brought the questionable safety of Intamin Accelerators to public view. After being closed in 2002, Ghost Town in the Sky renovated and reopened their largest coaster, Cliff Hanger. But it wasn’t so grand. The ride was only open for a few weeks before it was shut down again. It turns out there was a very small crack in the prototype custom-built train’s seats. Even after they fixed it, the rides status was in limbo. It would be open one day, and closed the next. It was not a success. As if anyone could had predicted, the park filed bankruptcy in November since they couldn’t pay back. The park will go before a judge to decide wether or not it will be auctioned off. This shows how sometimes parks assume they will have large crowds when they won’t. The park should have researched wether or not they could get the crowds to pay for something this big. It’s an unfortunate truth, but you can’t pull money from the sky. Seems this Ghost Town in the Sky will be a true Ghost Town now. 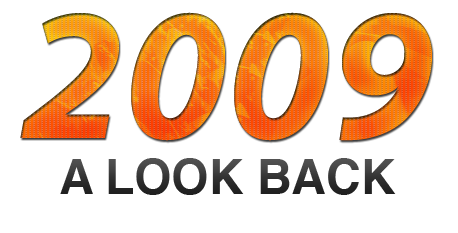 This concludes our look back at 2009. Leave your park thoughts on these and tell us if you think there are any other losers for 2009. 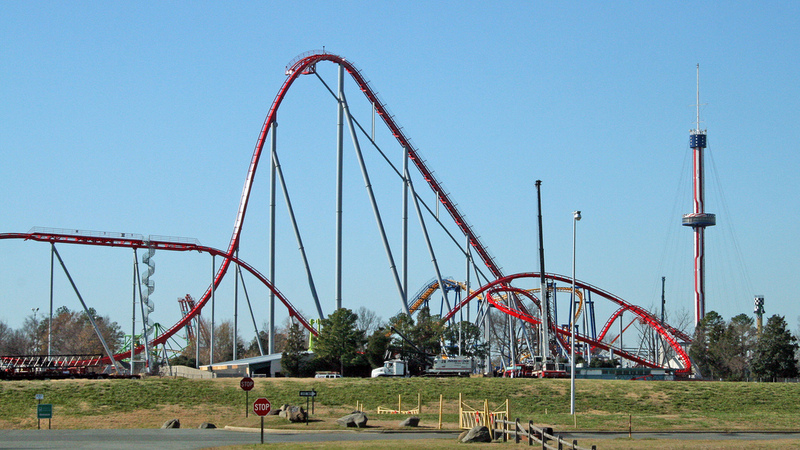 Diamondback turned out to be the biggest ride of 2009. Like other B&M Mega Coasters, it created hype all over. In its first season, it received more than 1.8 million riders, a number you would expect to see at a Disney or Universal park, not Cedar Fair. The ride has extreme amounts of airtime, and some enthusiasts say it is the most extreme coaster, in the sense of airtime, they’ve ever been on. We heard reports of lines going for more than two hours, even stretching out onto the midway during the busy summer days. But it seems the wait was well worth it for people. Diamondback snagged spot #7 on Amusement Today’s top steel coaster list for 2009. One of the most anticipated rides, Manta at Sea World Orlando was actually finished ahead of schedule, giving it a few weeks advantage of being open heading into the busy summer season. 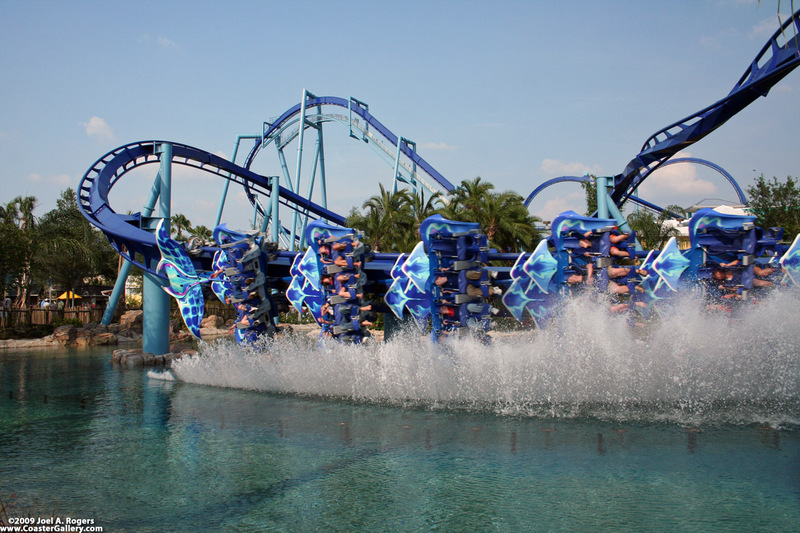 Manta has been called one of Sea World’s best coasters, and with good reason. Instead of plopping a coaster onto a flat piece of land, they landscaped the area and themed the queue with beautiful rock work, huge tanks filled with hundreds of manta rays, and lighting effects to give the feeling of being underwater. Beyond the great theme, many say the coaster is the most intense at a Sea World park. The coaster is a B&M Flyer and has many moments throughout the ride where the positive g-forces are pushing down hard. It was designed to be a family-friendly ride, but has turned out to be an intense coaster that you would normally see at a regular amusement park. The biggest surprise of 2009 was the GCI wooden coaster Prowler at Worlds of Fun. The ride at first did not receive as much hype as the larger coasters, but it came out and won big time. It started early in the season when enthusiasts said that it packed a punch. It turned out to be true. Prowler won the Golden Ticket for best new ride of 2009, and was ranked at #8 for best wooden coaster. Pretty impressive! I had the chance to ride Prowler, and it was quite a ride. It was surprisingly smooth, and the ride never lost its pace. I’m glad to see Worlds of Fun won with this ride. Another GCI creation, Terminator Salvation: The Ride did not receive as many awards, but it was hailed as a comeback for Six Flags Magic Mountain, a park that has been lacking lately. Many found it odd for a wooden coaster to be themed to Terminator, but it turned out to be a great combination. Like what they did with X2, Six Flags put in various effects including sound onboard the trains, tunnels, and something unheard of: fire. Yes, fire with a wooden coaster. Luckily, it was engineered to not be near the coaster to close. The one complaint we’ve heard though is that the queue line is not re-ride friendly. It takes at least ten minutes to move through all the pre-show areas, even if there is no line. The theme hasn’t been established well either. However, it was good to see that Six Flags is trying to improve Magic Mountain’s image. It has been falling the past couple of years, but it seems to be improving now. Next up, we’ll take a look back at the losers for 2009. Leave your park thoughts on these rides, and others we may not have covered that you thought were winners! What’s the favorite Hyper/Mega Coaster Manufacturer out there? It seems B&M is the winner, with Intamin in a close 2nd. World’s of Fun launched their new website recently, it takes on the same design that originated on Cedar Point’s website and was implemented for Knott’s Berry Farm several months ago. It’s overall a good redesign as the old site was becoming out-dated and was pretty hard to navigate.